Creating impact at Media City, Salford is no mean feat; the new waterfront development has digital creativity, learning and leisure at its heart, and is home to the BBC, ITV, Salford University amongst many others. 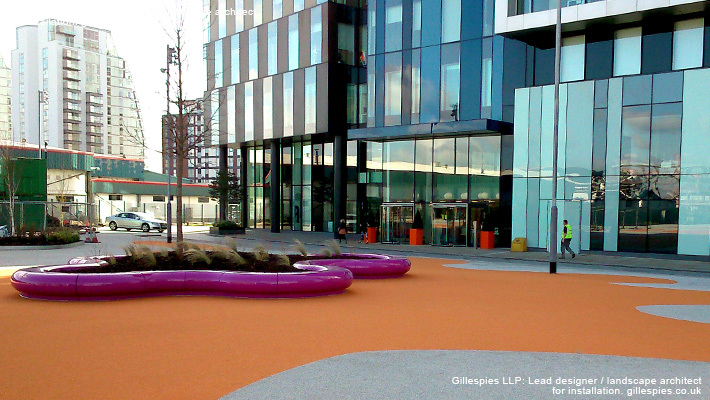 Landscape architects, Gillespies LLP, were contracted to create a fun recreational space for residents to enjoy before phase two of Media City got underway. 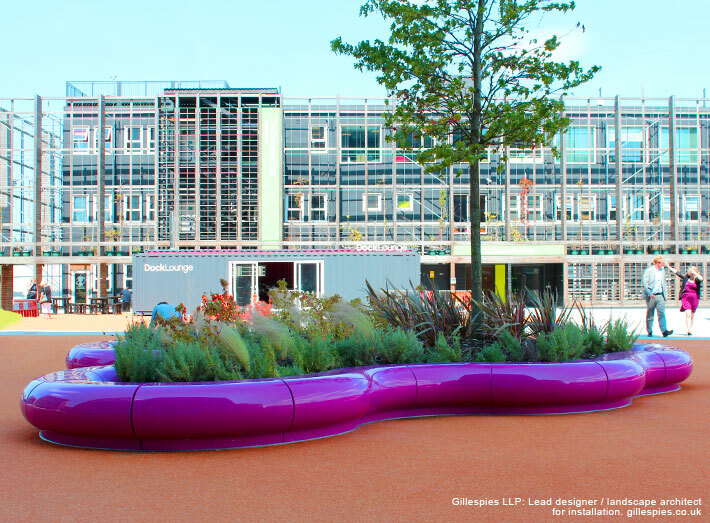 To complement the open area's bright and colourful 'splat' theme, the landscape architects were looking for something colourful, bold and innovative to create the ideal centrepiece – GeoMet offered the ideal solution. "We wanted something playful to fit into our scheme, and needed the piece to be durable to put up with a lot of 'wear and tear'. GeoMet's Halo seating is handmade, composite moulded so we knew it would stand up to the rigours. The seating is also modular in construction and gave us the opportunity to create something unique, without having to invest in a bespoke mould. We specified Halo in a bright pink to provide a splash of colour to animate the space. 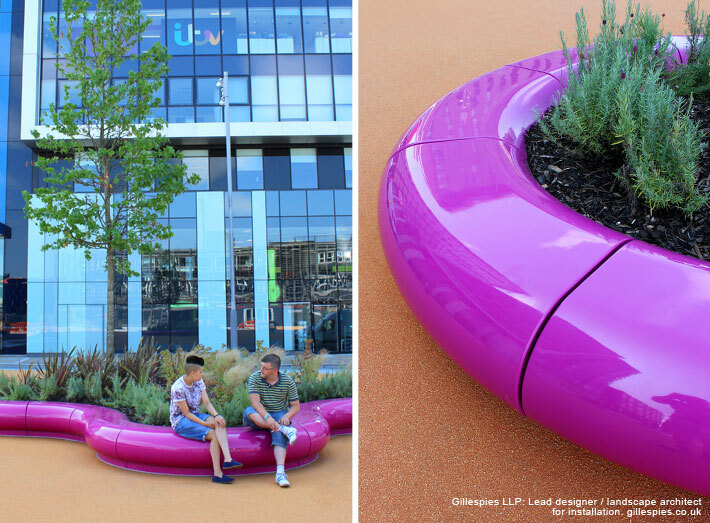 "The Halo's curved lines allowed the seating to be put together in a splat-like shape to complete the zingy vibrant outdoor look and feel of the area." 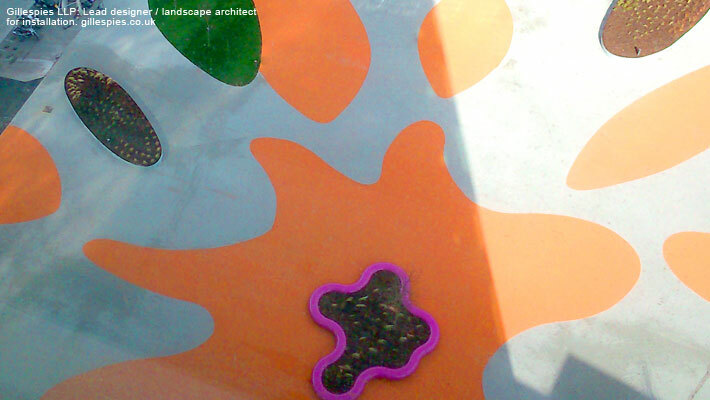 Following installation the centre of the Halo construction was filled and planted to create an attractive green space. The finished piece was fitted with LED lights and is now enjoyed by residents and visitors as a place to sit and enjoy the dynamic surrounds, whilst drinking a coffee or two from the nearby café. The installation was completed in 2014 and two years on Halo has stood-up to the pressures of modern day living and looks as fresh, clean and colourful as it did on day one. Halo is a beautifully striking yet comfortable seat which can be adapted to fit most spaces. 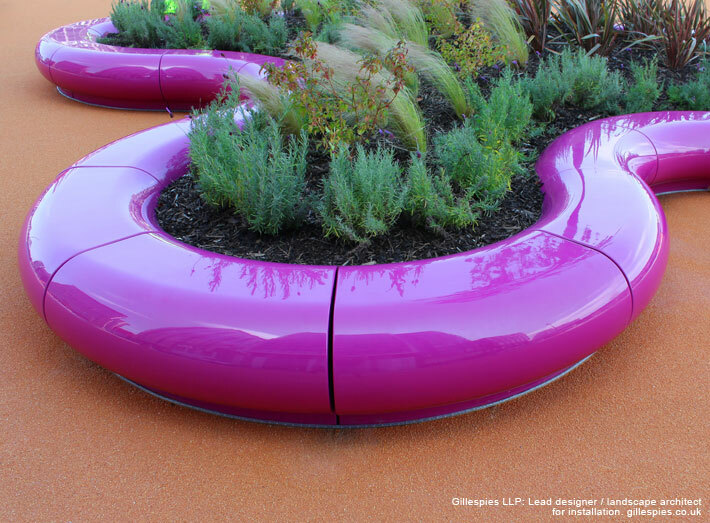 The curvaceous circular designs can be made in any BS/RAL colour to match any colour scheme or corporate interior/exterior. Halo is lightweight and modular in construction and easy to install. Halo seating installed at Media City, Salford. Halo seating - colourful, bold and innovative, seating that creates the ideal centrepiece. 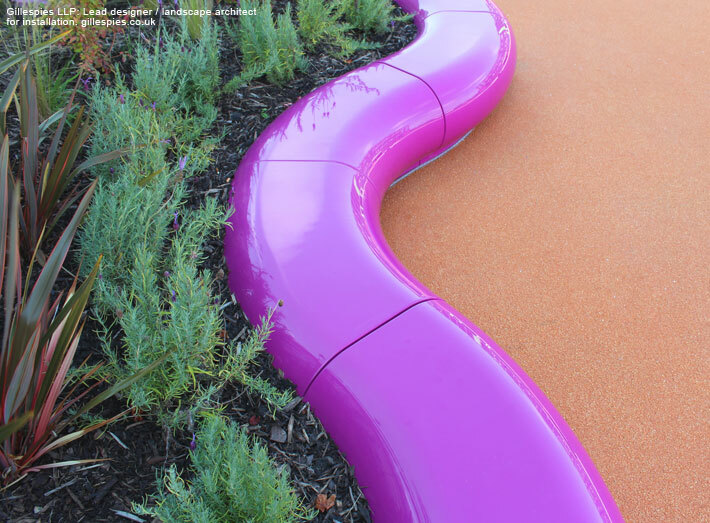 Made in any BS/RAL colour to match any colour scheme or corporate interior/exterior. Halo is lightweight and modular in construction and easy to install, available as seat and planter options. A birds-eye view of the 'splat' installation area completed in 2014. The centre of the Halo seating construction was filled and planted, and fitted with LED lights. Two years on, Halo has stood-up to the pressures of modern day living and looks as fresh, clean and colourful as it did on day one. Halo seating, modular seats perfect for free form arrangements. Halo seating circle - 8 Halo segments fit together to form a 3m diameter circle. "We wanted something playful to fit into our scheme, and needed the piece to be durable to put up with a lot of 'wear and tear'. GeoMet's Halo seating is handmade, composite moulded, so we knew it would stand up to the rigours. The seating is also modular in construction and gave us the opportunity to create something unique, without having to invest in a bespoke mould. 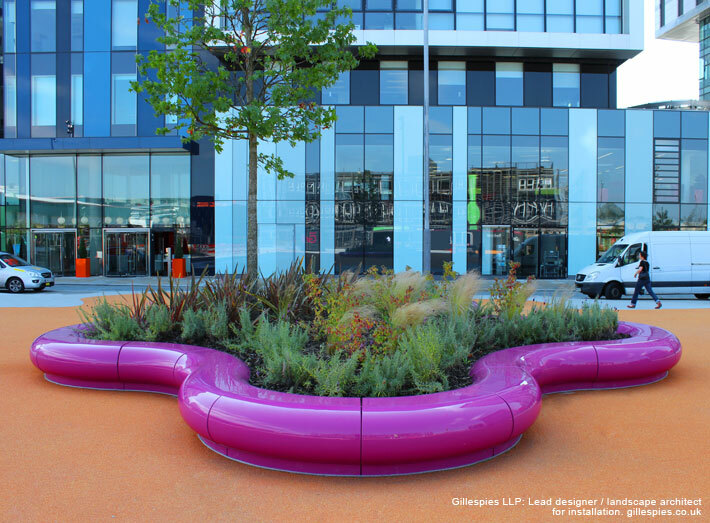 We specified Halo in a bright pink to provide a splash of colour to animate the space.The Halo's curved lines allowed the seating to be put together in a splat-like shape to complete the zingy vibrant outdoor look and feel of the area."